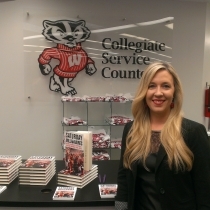 Many of the questions I’m asked by students and others looking to get into a sports career relate to how I ended up with my current position as ESPN’s sports business reporter. So, I wanted to take this opportunity to tell you my story. 1. Be willing to start at the bottom. 2. Be willing to work for free. 3. Be willing to work harder than everyone else. Unless you’re a professional athlete who can parlay that experience into a sports career, I recommend the three steps above. It’s what I did. 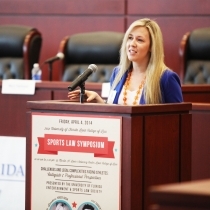 During law school I found myself without an outlet for my passion for baseball. So, I started a Braves blog one afternoon. After just a month writing the blog, another Braves blogger who was part of a larger network of bloggers asked me to join him. It didn’t pay, but his blog got better traffic than mine. So, off I went to write for his blog. The next year, I had the opportunity to intern for the WTA Tour. Finally, I could get my foot in the door with a sports organization. It wasn’t baseball, but it was sports. Once it was on my resume, I could apply again to baseball teams. And this time I’d apply to more than just the Braves. I’d learned you have to be willing to go anywhere you could get a job. Then I learned you also had to be willing to start at the bottom – financially, that is. Turns out that when there is an abundance of interest in a position they don’t have to pay you much. I did get an offer from a baseball team as I graduated law school, which was the result of me emailing someone at the team and asking if they had any openings for attorneys. It paid exactly 1/4th of the amount a medium-sized firm in Atlanta had offered me. 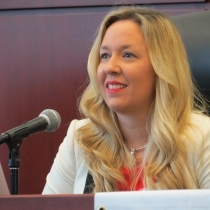 I had student loans and dreams of owning a home, so I took the law firm job. Ever heard that things happen for a reason? It was at that law firm that I met someone who set me on a whole new course. During my last year of law school, I wrote a paper for my Taxation class on internal taxation in baseball (i.e., revenue sharing and the luxury tax). I could always make any class relate to baseball, which is when I think I realized I had a passion for sports beyond merely being a fan. I finished law school with baseball-themed papers from Taxation, Sports Law and Historic Preservation. Back to the story. My taxation professor was kind enough to help me pursue publication for my paper, and it appeared in the Spring of 2007 in the University of Denver Sports and Entertainment Law Journal. Flash forward to the fall of 2007 when I was a first-year associate. A chance meeting with a client who was also a baseball fan led to my showing him my article. As it turned out, he knew the editor of a sports publication and forwarded it to him. That editor knew an editor at a publishing company and forwarded it to him. To make a long story short, I signed a contract to write a book based on that article in December 2009 with that same publishing company. That book, BALANCING BASEBALL: HOW COLLECTIVE BARGAINING HAS CHANGED THE MAJOR LEAGUES, is due out next year. Around the same time I signed the book deal, I decided to leave the Braves blog I’d been with for several years and go back to having my own blog. I started It’s a Swing and a Miss in January 2010. I had realized I enjoyed writing about the business side of baseball far more than writing about games, so the Braves blog just wasn’t the right fit anymore. It also gave me the chance to work through some of my ideas for the book and get feedback from those who read my blog. Then, in April of 2010, I was watching a video clip of Forbes’ SportsMoney editor, Michael Ozanian. He was discussing an aspect of Major League Baseball’s collective bargaining agreement, and I thought he said something misleading. I decided to email him and express my thoughts on the issue. I added in that I was working on the book and that I’d be happy to collaborate with him if he ever covered MLB’s collective bargaining agreement again. I pointed him to my journal article and other pieces I’d written online. Much to my surprise, I received an email a few hours later asking if I’d like to write for SportsMoney on Forbes – for free. I tried to wait more than 30 seconds to respond so they wouldn’t know just how excited I really was to write for Forbes. After all, who turns down that kind of exposure, even if it is for free? By this time, I had moved to another law firm. This law firm hired an outside publicist to handle their work, and a colleague suggested I meet with her to see if she could help market my book when it was published. We had a lovely lunch and talked about my long-term goals. I told her one of my goals was to appear on a show called SportsNite that Comcast Sports Southeast tapes here in Atlanta. I had been a long-time viewer of the show and thought I could appear if they ever needed an expert on collective bargaining. The publicist suggested I email the show. “Just email the address on their webpage?” I asked, doubting the effectiveness of this approach. Truth is, I shouldn’t have been surprised. After all, I’d gotten the offer to work for a baseball team after emailing the General Counsel and asking if there were any jobs available. I got my book deal because I emailed a client my journal article, hoping he might be interested. I got my position at Forbes because I emailed the founder and offered my expertise. Why wouldn’t Comcast be the same? One interview and a bundle of nerves later, I was live on the set of SportsNite. 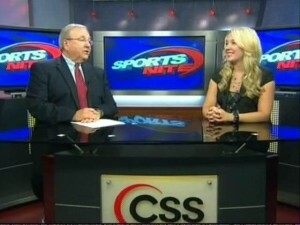 I went on to get a segment named after me (“Miss SportsBiz”), a blog on the CSS website and a weekly appearance. This was my first paying gig in sports media, but I wasn’t exactly making a living. If you divided my per show fee by the number of hours I put into preparing, it was nearly a losing proposition. By the end of the summer of 2010, I was being asked to appear on podcasts to talk about baseball. I’m not sure any of them had much of an audience, but I did them for the experience, and because I like to hear myself talk (as I’m sure you’ve figured out from the length of my posts). Comcast had required me to branch out from baseball for my segment, and I soon began writing more and more for Forbes on other sports. By the fall of 2010, I was becoming more fluent on each of the four major professional sports leagues. My first appearance on a live radio show was in October 2010 with the Milwaukee Sports Geeks. I’d met Chris Carter on Twitter through my various blogging efforts and he asked me to be on his show one Sunday morning. I was shaking through the whole thing. By December of 2010, I was doing interviews several times a month for radio stations all over the country, most of whom found me on Twitter. (If you’ve been to any of my presentations, you know I’m a big proponent of Twitter!) At that point The Pulse Network found me through tweets I was sending from MLB Winter Meetings. By early 2011, they had created a weekly segment for me. I still wasn’t making any money though. The more I wrote about the impending NFL lockout possibility during the 2010 season, the more radio interviews I was asked to do. I used my legal knowledge to bone up on the collective bargaining agreement and the law surrounding these types of negotiations and agreements. Before I knew it, I was on the radio in a dozen different cities. Around the beginning of 2011, I was shocked to find that the topic I wrote about most often wasn’t MLB or the NFL’s collective bargaining agreement – it was college football. I was doing a Conference Finance Series on Forbes and getting tens of thousands of hits. I’d finally found my perfect niche. I started BusinessofCollegeSports.com on April 18th, 2011. After consulting with the owners of several other amazing sports blogs, I decided to start my own. The decision was primarily based on the ability to post immediately (without oversight) and organize the categories how I pleased. I threw together a WordPress blog with a terrible header and sat back to see what happened. In the first two months, BusinessofCollegeSports.com received over 100,000 unique hits. It was linked to online by ESPN, CBS, NBC, the Seattle Times, the Atlanta Journal and dozens upon dozens of other networks, newspapers and blogs. I did a remote interview for a television station in Tampa. I began to do interviews on the radio on an almost daily basis. I did nationally-syndicated and satellite radio with guys I really admire like Tim Brando. I even picked up my own radio segment on Wednesdays at 5:30pm ET with Shawn and Wally on Arkansas Radio Network/Sports Animal 920. And now I’m writing another book, this one on the business of college football. The amazing feedback I’ve received from this website has convinced me that there is a demand for analysis and news on the business surrounding college sports, particularly football. I’m passionate about this subject, and I love sharing with you all what I find. Before joining ESPN in October 2011, I made a grand total of $5,000 for all my sports work over the previous five years. That’s it. I didn’t make a living. I made a little spending money off a hobby. I put at least three hours into BusinessofCollegeSports.com every single day last year until joining ESPN. Some days it was far more. I was emailing and calling athletic departments, reading through eighty-page budgets and writing a post each weekday. I used my lunch break or woke up early to go on radio shows to do interviews. Before an appearance on SportsNite or The Pulse Network, I spent hours researching topics. I treated my sports work like a part-time job. There was virtually no pay and no benefits, but I loved it. The only advice I can give you if you want to work in sports are the three keys I shared before: You have to be willing to start at the bottom. You have to be willing to work harder than everyone else. And you have to be willing to work for free for awhile. Oh, and it helps if you’re willing to email anyone, anytime and ask for anything! Thanks for sharing. I enjoy reading your work. Thanks for the helpful insight! Glad to hear you’re doing something you love, and making a living while doing so. Thank you for sharing. Very inspiring for young aspiring sports professionals to read. I have similar aspirations, and reading your post confirmed I’m on a similar path to becoming the sports business reporter I’ve always wanted to be. Thank you for sharing your story and for being an inspiration! I knew that there was some thing special about you, very inspiring and admiring work, evn the little things go along way, you bring a whole new respect to woman in the sports field, you carry yourself in the up most eloquent manner. Thanks for sharing Suzie and for the words of encouragemant. I’m majoring in sports media, with a business minor and planning to go to onto law school. My career aspirations are to become an agent. I have so many questions I’d love to ask you if you had the time! Thanks for the good read! Feel free to email me any time. I’ve been trying to feature questions in posts. You can find an email link at the bottom of the About page. Trackback: Does Volunteering at Sporting Events Help My Career? Great post – a lot of people should appreciate you for sharing this. Simply contacting people who may seem out of reach can really work wonders. A lot of people defeat themselves instead of trying it.